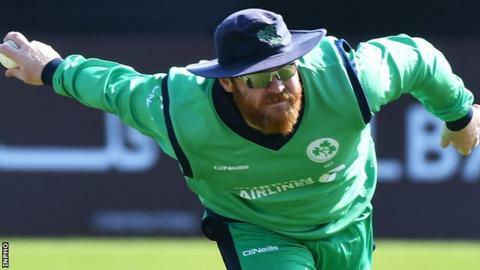 Skipper Paul Stirling wants Ireland to "play the ball, not the man" in their Twenty20 series against Afghanistan. Overfamiliarity is likely to be a factor when the Irish play the Afghans in the next five weeks, across all three formats of the game in India. "We have played them a lot over the last few years. We know what to expect and hopefully we can go out with a positive mindset," Stirling said. The first T20 game takes place on Thursday in Dehradun at 13:00 GMT. Stirling has identified Afghan bowler Rashid Khan as the man Ireland have to stop. "He has been the main difference between the two sides in the recent past," said the 28-year-old batsman. "Whenever he performs well for them, or we don't play him particularly well, I think that really is a big advantage for Afghanistan, so he'll definitely be one of the bowlers we will be trying to negate. "I think Afghanistan have gone better in the T20 stuff of late, though we know what they bring. They have very good spinners and a batting line-up that really comes hard against us. "I think if we play the ball and not the player in this competition then we will go a lot better." Stirling and Ireland team-mate Kevin O'Brien played for Kandahar Knights in the inaugural Afghanistan Premier League last autumn. That experience gave the Ireland captain an insight into the strength in depth of the cricket nation. "It was good to get a feeling for who was behind the first 11 - in the Test squad and T20. "They have picked a few people who haven't played as many games, so [being involved in the APL] certainly helped from that point of view. "But I think with the mainstay of the Afghanistan team we already know what they're capable of and I think it is about trying to counteract that."